I have a confession: I dislike creating cards in bulk. Yup. It's true. I absolutely love creating a fresh, new design for each and every card I make, however, the truth of the matter is, when it comes to Christmas cards, sometimes you just need LOTS and it is a bit quicker to do bulk batches. That being the case, I make a compromise. I create batches of five or ten cards each. I still don't do lots, but five or ten is totally doable. Creating in bulk is a bit of a different ball game, though, to be honest. You have to have a design that is simple enough and yet something that still stands well on it's own. I decided to pull out my awesome deer stamp from Bossy Joscie and a great sentiment from Stampendous! for this batch and I love how they turned out! Easy peasy, folks! For reals, though. As you may have noticed, I am mildly obsessed with the white and gold color combination. I just think it is absolutely GORGEOUS! It also allows for a strong impact with a simple design. I used gold embossing powder and some gold string to bring some shine to this design. Annnnnnnd....I sorta kinda love it. I do. I really and truly do. The square is die cut using the Spellbinders Pierced Squares dies. They are awesome. I created five of these in a under an hour or so. They came together quickly, but still totally feel like 'me'. Do you create cards in bulk at all? How many is your limit? I love this. I am very much like you, five or six of something is okay, but I need MANY designs as well. OH!!!!! so pretty!! 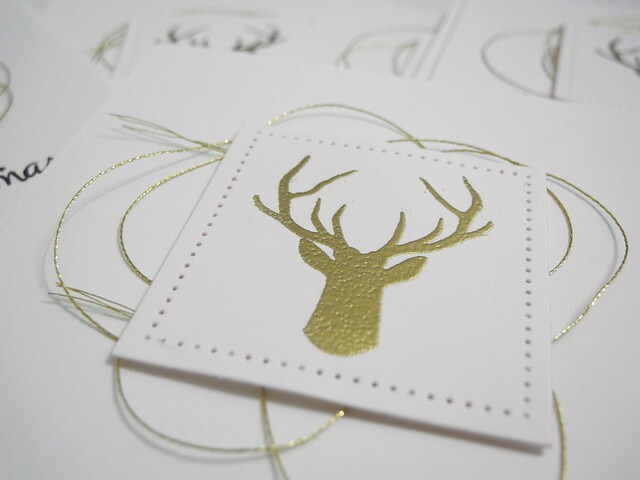 LOVE that gold thread and the gold stag!!! so elegant and pretty and trendy!! LOOOOOVE!!! Beautiful card set! And I totally agree with you! A can usually do a few of the same card... but I'd much rather do a bunch of different card sets than the same card for everyone.. that would be sooo boring! Beautiful card and great visual impact. Yes, the keys to crafting success are making it doable and loving it at the same time. Thanks for sharing our retro stamp on your card today! Merry Christmas! Your card is beautiful. Yes, I do create in bulk but I don't like it AT ALL. you are right about find the right mix to have a card not too fussy or heavy but a pleasing design with enough on it. very hard! GORGEOUS! I have a real thing for deers!! 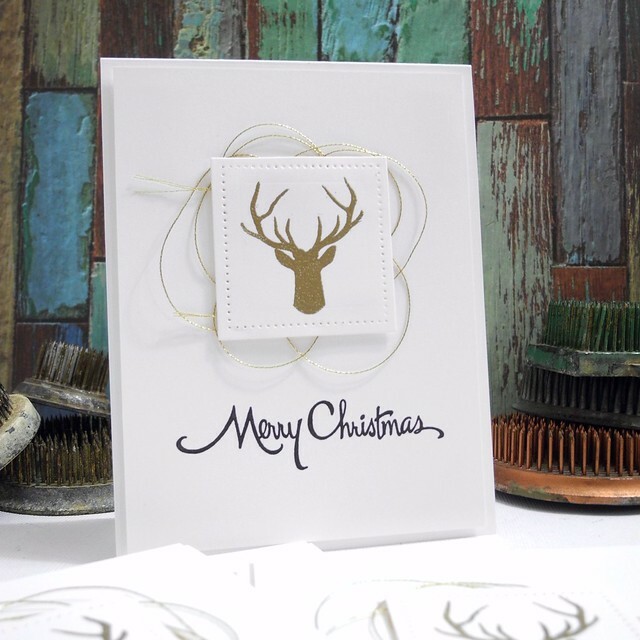 Oh so pretty from embossing to gold thread, absolute perfection ! Wonderful design! I love the pierced square, the deer, the gold, the sentiment! Thanks so much for sharing and inspiring! Beautiful Jennifer. I love the gold twine in the bg.